Welcome back to another exciting day here at Satisfaction for Insatiable Readers. Today, we feature not a book review....not a contest...not even an interview or blog tour...but something JUST as much fun and for a GREAT CAUSE. What’s black and white and pink all over? 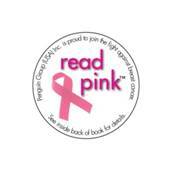 The initiative by the Penguin Group (USA) called Read Pink™ in honor of Breast Cancer Awareness Month. This literary embrace of a life-saving cause last year resulted in nearly 400,000 best-selling romances shipped with Read Pink seals and information about the charity it supports – the Breast Cancer Research Foundation®. In 2010 and 2011, some 12,000 floor displays also carried the Read Pink message. The result raised awareness for BCRF, the only cancer organization to receive A+ from the Institute for Philanthropy. “We are delighted to be able to continue this initiative in support of The Breast Cancer Research Foundation for a second time. We hope that awareness for the Foundation’s work will only grow by bringing more attention to this important cause,” said Leslie Gelbman, President of Mass Market Publishing, Penguin Group (USA). To mark the occasion, Penguin Group (USA) is again making a $25,000 donation to The Breast Cancer Research Foundation. The novels chosen for Read Pink 2011 are eight bestselling mass market titles by some of Penguin Group (USA)’s most beloved female authors. Included this year are Nora Roberts, Catherine Anderson, Christina Dodd, Jillian Hunter, Lynn Kurland, Amanda Quick, Bertrice Small and Lauren Willig. More than 300,000 copies of the special editions will be printed featuring Read Pink seals on the covers. In addition, Penguin Group (USA) is including information in the back of each book in an effort to make readers aware of The Breast Cancer Research Foundation and encourage them to become actively involved in supporting the organization. For more details about the Read Pink initiative and to view a complete list of the participating retail outlets, please visit www.penguin.com/readpink. The Breast Cancer Research Foundation® was founded in 1993 by Evelyn H. Lauder as an independent, not-for-profit organization dedicated to funding innovative clinical and translational research. In October 2011, BCRF will award $36.5 million to 186 scientists across the United States, Canada, Latin America, Europe, the Middle East, Australia and China. Currently, more than 90 cents of every dollar donated is directed to breast cancer research and awareness programs. With exceptionally low administrative costs, BCRF continues to be one of the most efficient organizations in the country. BCRF has received an“A+” from The American Institute of Philanthropy. For more information about BCRF, visit http://www.bcrfcure.org/. Penguin Group (USA) Inc. is the U.S. member of the internationally renowned Penguin Group. Penguin Group (USA) is one of the leading U.S. adult and children's trade book publishers, owning a wide range of imprints and trademarks, including Viking, G. P. Putnam’s Sons, The Penguin Press, Riverhead Books, Dutton, Penguin Books, Berkley Books, Gotham Books, Portfolio, New American Library, Plume, Tarcher, Philomel, Grosset & Dunlap, Puffin, and Frederick Warne, among others. The Penguin Group (http://www.penguin.com/) is part of Pearson plc, the international media company. Be on the look out for these special editions (including the titles you see pictured here + a few more) in your local bookstore or online outlet of choice and help spread the word on this worthy cause. You never know who will be affected by this ever present disease, but we can all certainly play a part in supporting the research for a cure to end it once and for all. Special thanks to Kate at Meryl L. Moss Media Relations for the information I've shared with you today. To find out more about their current and upcoming promotions, feel free to seek them out online. For more information on the READ PINK campaign or The Breast Cancer Research Foundation, simply click on any of the links in the above post. How cool. I had no idea. Great cause. Thanks for sharing. Thanks for bringing this great cause to our attention. We have many pink events and promotions here in England but I am not aware of this particular one. Thanks for sharing this! Such a great cause! Taste Testing Tuesdays...on a Wednesday! Read for the Record Day: News Flash and Review!